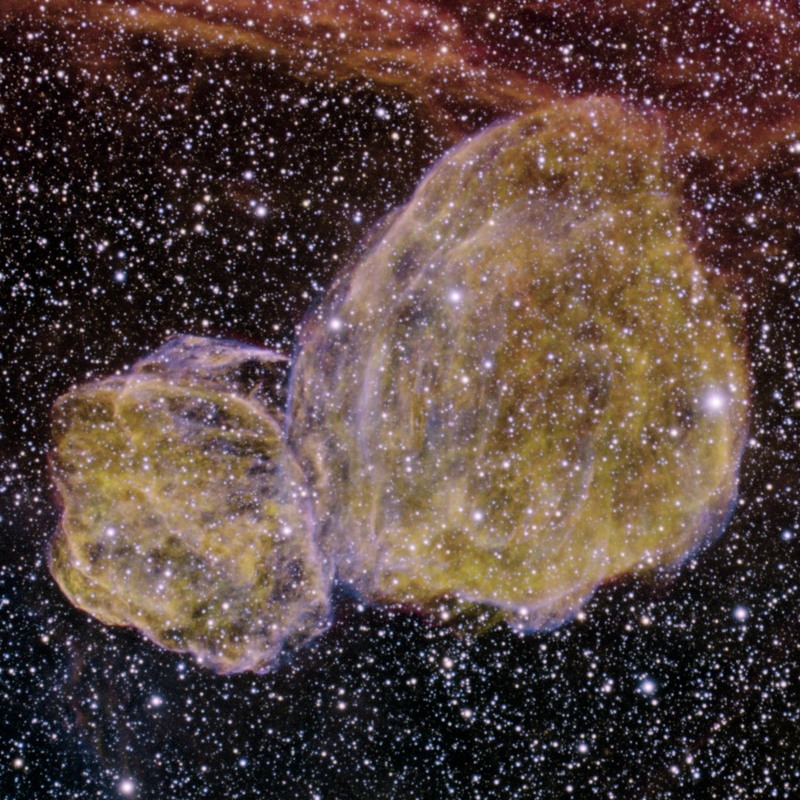 Explanation: Are these two supernova shells related? To help find out, the 8-meter Gemini Telescope located high atop a mountain in Chile was pointed at the unusual, huge, double-lobed cloud dubbed DEM L316. The resulting image, shown above, yields tremendous detail. Inspection of the image as well as data taken by the orbiting Chandra X-Ray Observatory indicate how different the two supernova remnants are. In particular, the smaller shell appears to be the result of Type Ia supernova where a white dwarf exploded, while the larger shell appears to be the result of a Type II supernova where a massive normal star exploded. Since those two stellar types evolve on such different time scales, they likely did not form together and so are likely not physically associated. Considering also that no evidence exists that the shells are colliding, the two shells are now hypothesized to be superposed by chance. DEM L316 lies about 160,000 light years away in the neighboring Large Magellanic Cloud (LMC) galaxy, spans about 140 light-years across, and appears toward the southern constellation of the Swordfish (Dorado).